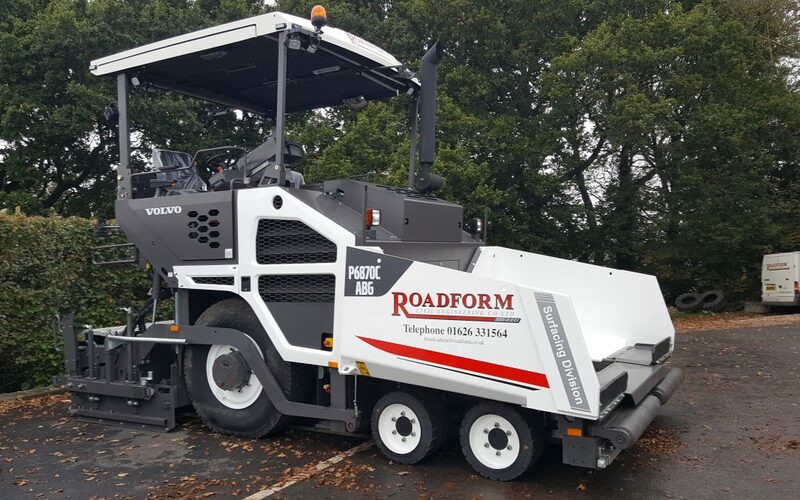 Roadform are proud to announce the addition of a powerful new road surfacer to our fleet of vehicles. The Volvo P6870C ABG is a giant workhorse with six-wheel drive, offering maximum power when paving wide areas with difficult ground conditions. It’s white, it’s fresh, and it is adorned with our logo and ready to go! With the recent addition of a new loader to the fleet, we can get all our equipment on-site quickly and efficiently, and this new road surfacer opens up a whole different level of what we can do on the job. It’s an all-in-one paving machine that boasts great width and depth, with the power to ensure no area of land is too difficult to manage. You can expect to see us plying our trade all across the South West of England – we have been providing civil engineering solutions around the region for almost 30 years. You’ll find it difficult not to see the Roadform logo on one of our trucks working around this area; we have great relationships with local authorities and private clients who need our services time and again. The investment in this road surfacer is symptomatic of our wider goal to expand by adding superb machinery to our fleet. We always want to get the job done right, so all our staff receive full training in proper usage of any new machinery we purchase. If you require someone to do the work on a civil engineering project, our new Volvo road surfacer equips us with a powerful tool for working in any location. Get in touch with us today, you’ll find our friendly team can supply you with all the information available as to how we can best serve your needs. Be it road building, civil engineering or site development, Roadform has everything you need to get the job done properly. Merry Christmas and a Very Happy New Year to all our customers from Roadform.